I first gave Joel steamed white fish and that went really well. Next was salmon, which he especially loves with chunks of baked sweet potatoes. So far, we're doing well with seafood so I feel much better experimenting with various recipes. 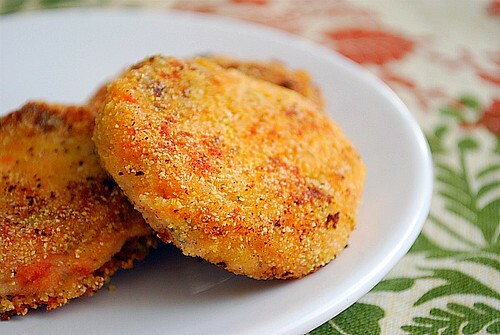 One recent recipe I made was for Salmon Potato Patties. This is a good way of introducing seafood to kids. Feel free to adjust the amount of salmon in the dish to your or your child's preference. You could even sub the salmon for other kinds of fish including cod or tilapia. It's important to have the fish cooked beforehand, however you'd like. For the patties I made, I grilled our salmon and used leftovers to make them. Joel really took to these well and it's a great way for me to use up leftover seafood including salmon, cod, tilapia, shrimp, etc. In a medium bowl, mix salmon, eggs, garlic and herb seasoned dry bread crumbs, mashed potatoes, onion, garlic, dill weed, celery salt, salt, and pepper. Form the mixture into 2 inch balls, and flatten into patties about 1/2 inch thick. Dredge in fish fry coating and set aside. Heat a medium non-stick skillet over medium heat. Spray skillet with cooking spray and pan fry patties about 5 minutes on each side, until lightly browned. This looks so good and I am sending recipe to my mom because this is something she will love!